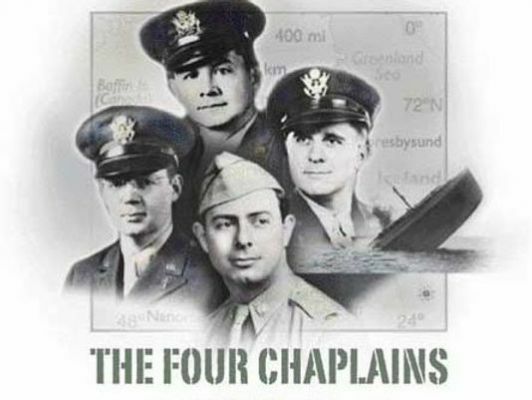 STURGIS, SD - VA Black Hills Health Care System invites the public to attend the Four Chaplains Memorial Service at 1:30 p.m. February 10, 2019 at the St. Francis of Assisi Catholic Church in Sturgis. Local Veteran organizations will participate in the event by placing wreaths at the altar during the program. Immediately following the service, the public is invited to a chili feed to be served at the Sturgis Veterans Club in Sturgis. The Four Chaplains Memorial Service honors four Army Chaplains - Lt. George L. Fox, Methodist; Lt. Alexander D. Goode, Jewish; Lt. John P. Washington, Roman Catholic; and Lt. Clark V. Poling, Reformed Church of America, - four men of different faiths, on a rapidly sinking ship, who gave their life jackets and lives so that younger soldiers might survive when the USS Dorchester was torpedoed and sunk by a German submarine on February 3, 1943.